Just before the start of free agency, the Panthers are locking up one of their own. 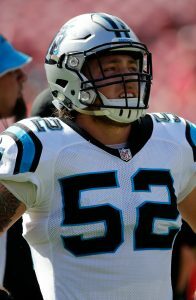 Carolina is re-signing linebacker Jared Norris to a two-year deal, according to Ian Rapoport of NFL Network (Twitter link). Terms of the deal weren’t announced, but it’s likely pretty close to the minimum. Rapoport notes that the team gave him a $150K signing bonus, which would seem to indicate they plan on him making the team out of training camp. Norris was a standout linebacker at Utah, but went undrafted in 2016. He latched on with the Panthers, and was able to make the team as a rookie. He appeared in just three games this past year after he was placed on injured reserve in October with a toe injury. Norris hasn’t played a single snap on defense in his three years with the team, but has been a key special teamer when healthy. An inside linebacker, Norris will provide emergency depth on defense and should be making plays on special teams again next year.